This video has been making the rounds on social media for the past week. In short, Austrian rider Bernhard Maier, was banned from competition for three months after this round on a Paddy’s Darco, a 10-year-old Irish Sport Horse gelding. Maier bought Paddy’s Darco earlier this year, ostensibly for his daughter (now that’s a scary thought). Bernard Maier’s round on Paddy’s Darco hit the show jumping wall of shame last week. The round is grim. It’s hard to believe that someone with FEI experience level (Maier’s has competed at this level since 2006) on a horse that has jumped around courses like this before could be so, well appalling. From the very first fence, where the pair crash through (rather than over) the jump, it’s painfully obvious that this pair is having more than just a bad day. It is terrible, scary and dangerous. Certainly not the kind of round that you want to go viral. The video has sparked outrage. And also some very interesting observations. Most people — myself included — are appalled that the ground jury didn’t put an end to this travesty after the first few jumps. In fact, Maier wasn’t sanctioned until the next day (after the video had gone viral). A lot people who watch the round blame the poor performance on Maier. Certainly, his aggressive ride only riles up a horse that looks tricky right from the start. His approach of gunning the horse at fences and then getting left behind and hanging on his mouth made my eyeballs bleed. But the other thing I saw was that a horse doesn’t like his job. Before they’ve even started jumping, the horse starts backing up, unwilling to go forward. 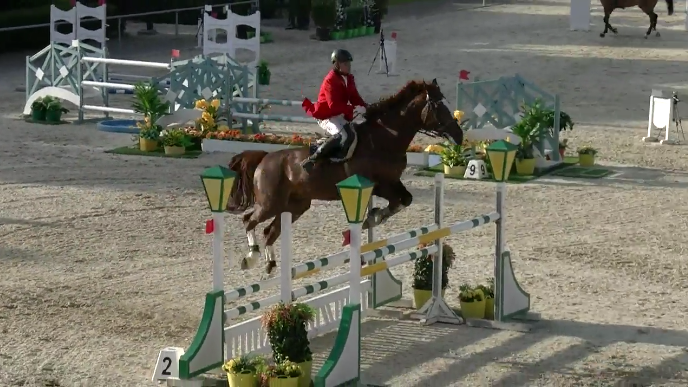 This well-bred horse has been bounced around a lot in the past couple of years — five different riders in five countries (Ireland, Columbia, Quatar, Italy and now Austria). That’s a red flag right there. A horse of this caliber doesn’t generally get passed around unless there are issues. Take a peek at his FEI Record and it’s spotty. Looking at past videos of the horse jumping around you can see the beginnings of the problems that are in full display with Maier in the saddle: he gets behind the leg, jumps up but not over, then lands in a heap. He fights his rider to the fences, getting flat. And he looks for that escape hatch coming into the jumps. Sometimes, just because a horse can jump, doesn’t mean he should become a jumper. You can see some of the issues that surface later. This is not an easy horse to ride but he has the scope and the step that show the promise of greatness. Paddy’s Darco works better with a quiet, tactful ride. There’s some footage of Stephen Moore competing him at the beginning of his FEI career that’s quite nice (although you can see how much the rider influences his performance). After the video of his round went viral, Maier made this statement to the press. “Although the video shows our disturbing round in Wiener Neustadt, I am convinced the work and training is developing positively,” explains Maier. The issue with these horses is often people dump so much money into them they literally cannot even conceive of selling them cheap to someone who will take more time and/or do something else with them. Too many people have spent too much money believing that they are the ones who can tap into this horse’s potential. It’s just a shame that no one asked Paddy’s Darco what he wanted to be when he grew up. There’s been a lot of ink covering this showjumping incident. Is it enough for the Horse Show Associations to take a hard look, change rules? A number of horse and rider deaths in Eventing caused debate last year. What do you think? Certainly the fact that Maier and Paddy’s Darco were eliminated in a previous class at the same show should have triggered some kind of warning amongst the ground jury. When a horse and rider team pose a threat to themselves, there should be more leeway in removing them from classes. The only slightly redeeming factor is that he pats the horse at the end. Sigh. Not enough. This is a horse that doesn’t want to jump — at least not in the jumper ring. He didn’t want to jump for more tactful riders and he certainly doesn’t want to jump now. The right thing to do would be to find him a more suitable job. It’s pretty obvious to everyone except Bernhard Maier that he is NOT going to be the rider who improves this horse. I almost wonder if there’s an underlying soundness problem that causes him to hurt when he jumps. Poor horse. Obviously doesn’t like his job.